Create with Gwen: Dynamic Duo Stamp Cleaning! Stamp Cleaning made easy! For years, we cleaned stamps laying them all over the kitchen counter to dry after washing the ink off by "stampin" them on sopping wet paper towels! Now, I love to show off how easy it is to clean and condition your stamps with the Stampin' Up! Stampin' Scrub! 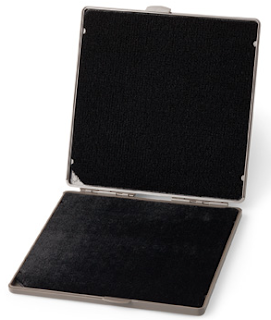 Dual-sided tray contains extra-large, washable, plush, black fiber scrub pads. To clean stamps, just spray cleaner on one side, (marked with rain drops) blot dry on the other side, (marked with umbrella). Cleans very detailed stamps. Each tray side: 7" x 7". Easy peasy! Clean and dry in a snap. Another must have tool in my stampin room!